This volume collects issues one through four of the Being Super comic arc. It outlines Kara Danvers as a teenager in Midvale, trying to fit in and be ordinary. There is a series of events in her hometown that calls this into question so that she has the choice to remain anonymous or to rise to the occasion and be super. The Kara Danvers in this comic isn't exactly the same as that on the TV show on the CW, so don't expect to see that version of Eliza and Jeremiah Danvers or her sister. Here, we have a similar origin story to Clark Kent's Superman: Kara was found in a pod by the Danvers family as a young child and was raised by them. She hid her speed and flight to fit in, and she has a loving set of parents and best friends. Kara is every bit a teenager like the rest of the kids in Midvale, and like every other teenager. She gets moody, she has a zit that appeared in time for yearbook pictures, and she feels as though her friends know exactly who they are when she's trying to figure out her place in the world. 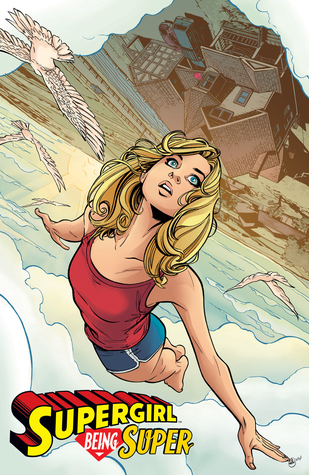 The art is great, and the story is an introduction to Supergirl for readers new to her story. As with most people growing up, it's a tragedy that forces Kara to reevaluate what she sees in herself and what she wants of the world. Eliza puts it perfectly: "We are who we are not just because of what's in us, but because of the things that happen in our lives. The things we cherish and the things we survive." Kara survives the earthquake and works through her grief to save her remaining best friend and parents, and Midvale as a whole. She's just beginning her journey, and it'll be a fun one to follow with her.